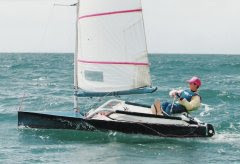 I recently found again an interesting article that I’d originally seen online written by Mike Lennon describing the dilemma of sailing a development class boat. Do you continue to develop your current boat hoping to gain through gradual refinement, and knowing your boat well or do you opt for the latest design features out there? With the pace of development in the Moth class, this is perhaps even trickier than in the 14 class Mike was originally referring to. I’ve been pondering this question for much of the season. I’ve done a number of changes to ‘Envy’, and all I think have been successful, but the 09 generation are fast... We are all learning so much about these boats all the time. With a likely windy Worlds, and the real strength of my current foils being the lighter more marginal stuff, I ordered a set of Mach 2 foils a while back. I figured Amac would have learnt a lot from the Bladerider, and as everybody was still trying to catch up with that, he’d probably be a generation ahead again. I had ideas on what I’d do, with lots of sketches and CAD files, but no time to do it, so I thought a set of these would be a good option. As for preparation time before the Worlds, ah that is another story..
Update: Thank you so much to those who've offered masts. I've had some generous offers from around the World. I'm once again impressed with the nature of this class, and how willing to help out people are. I think I'm sorted though with a chop and sleeve planned, and a possible borrowed mast to take as a UK fleet spare. 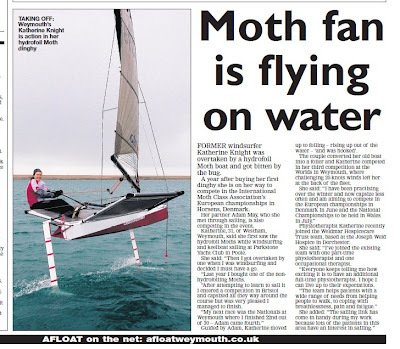 Carbon Footprint and Katherine have been getting a bit of local press coverage here in Weymouth! When Katherine spoke to her work about getting time off work to go to the Europeans they got excited about a different story related to them in the local paper, and some logos on the main. Since then their adventures have been a regular feature! I'm just trying to catch up with various news snippets that I thought were blog worthy and I found the photo above from Kiel. It seems like no matter where you go now you'll bump into a mothie. I was sure I recognised him when he lined up for a tuning run with Percy and Bart, and I was right, it was Andrew Landenburger, 89 Moth World Champion, and a fellow Tornado sailor as well. He's trying his hand in the Star class now. Race One: 12 – 15knots, a pin end biased line and a bit of a dilemma about going for the suspected wind bend on the right or a fraction more pressure in the left. I won the pin end, and headed left. I managed to squeeze through underneath Mike Lennon, and get my nose out in front enough to be able to tack and cross when I thought I was close to the layline. Those in the right looked okay but I was pleased to see them come out of the right on a bad angle in poor pressure. That would leave the race to the top mark between me and those who’d chosen a line above mine, and Mike Cooke who hadn’t had a very good start but was going fast up the middle on port. I got round first, with those above me overstanding, so it was Mike C round in second. I struggled in the waves a bit to find a good line, and Mike C got through low and fast below me. Mike L just behind him was next through. 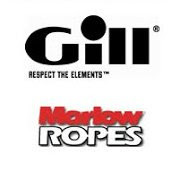 I gybed on the layline, then had a fast charging Rod Harris then roll over the top of me. Mmm 1st to fourth on the run, not ideal after the good first beat I’d had. I made gains up the next beat to round the top just behind Mike Lennon, and a few lengths ahead of Rod. Rod gained on me, but a pop out cost him some distance. Mike Cooke went for a quick swim but was able to right quick enough to lead Lennon round the leeward mark and up to the finish. Rod got passed me just before the leeward mark, but I was able to take a nice high line above him and hold him out enough to tack for the finish line first to take third. With the visibility down to less than half the beat, and an increasing breeze forecast to get up to 42 knots later in the day the fleet was sent ashore. 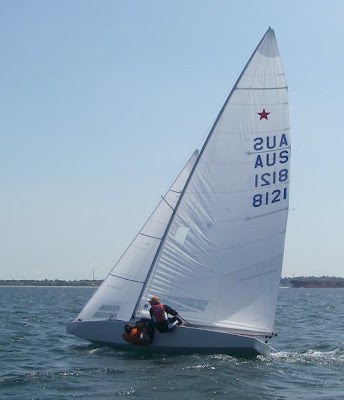 Race 3: With a pin end biased line Paul Hayden port tacked the fleet, and those off the pin end were looking good. I was about 1/3rd of the way up, and headed left until the layline. I was please to see everybody else carry on though! Mike Lennon had only gone a fraction further than me, and got over the top of me to lead round the top mark, with me a few lengths back. Paul Hayden had suffered from heading right with his great start and didn’t have the same angle as those coming out of the left. For a little while I had Mike Cooke just below me whilst going across on port, and I was worried he’d show some of his impressive pace again, but I managed to eek over him slightly, and didn’t see him again after he swim at the top of the run. On the run I was able to soak down inside Lennon and gybe for the leeward mark first to take the lead. Liking the left again I tacked off up the beat and played the shifts up the left again. This enabled me to extend my lead and start building a bit of a buffer. I was happy and fast on the runs on stbd in the flat water at the top, but I struggled in the waves on port at the bottom of the course. The chasing Mach 2’s of Lennon and Ricky Tagg got passed me at one point, but another good beat of playing the shifts got me back into the lead which I held to the finish. Race 4: An average start and okay first beat saw me round the top mark in about 7th or 8th, but I nailed the layline on the run and got inside most of the leaders who’d gone too far, to be second at the leeward mark behind Geoff Carveth. I remained here for most of the race until I managed to drop the mainsheet up one of the beats and in the resulting crash somehow managed to pitchpole upwind! By the time I’d righted I was back into fourth. Up the subsequent beat I was sure there was quiet a wind bend at the top, and so tacked well under the layline. I got the expected shift, and sailed through underneath Lennon and Harris to get back into 2nd. I didn’t quite get the gybe location right, and in the drag race to the line, Lennon got over me, with Harris manage to get the jump over both of us to take second behind Carveth. So the final run of the last race of the day decided who would be the overall leader after four races. It was tight at the top with Cooke leading on race win countback from Lennon, one point ahead of myself and Harris. Day three was blown off, so the championship was to be decided on the last two races on Tuesday. Race 6: So it would come down to the final race between Harris, Lennon and Cooke. I didn’t see much of it unfortunately as I pitchpoled shortly after rounding the windward mark in second.. From watching from a distance Cooke sailed a solid race to take the win, from Hignett who was obviously liking the wavy conditions. Harris beat Lennon, but The final result wasn’t completely sure when we all got to the beach though. Few people had noticed Paul Hignett’s performance on the water and Mike Cooke wasn’t sure of his results.... Nobody was sure until the results were posted at the club. In the final analysis Cooke took the Championships from Harris by 1 point, who in turn was 1 point ahead of Lennon. Impressive to have another close event finish after the Euros. So Mike Cooke is the 2009 National Champion. A well deserved win for him, and a great result for his new boat. The atmosphere within the fleet is as great as ever. It was mentioned by some that although we are racing each other there is greater camaraderie amongst the fleet than you’d find in many big boat teams sailing together! 1st Mike Cooke. Probably won this regatta on raw pace. The Ninja is fast make no mistake, and has good control in the waves. Starting was Mike’s weak spot, but he had sufficient pace that when he’d got into a clear lane he could pull through quite quickly, so perhaps he was just being cautious. Swimming in race 1, 3, 4, and 5 could have cost him the event but he was always able to come back enough. 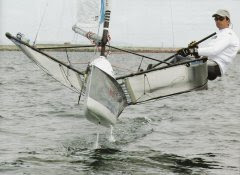 A large mainfoil, and small rudder, but a rig positioned further fwd than normal relative to the fleet, and no rudder angle adjustment may make people think again about some of the design choices out there. One thing is certain – Mike will be busy in Aardvark HQ for a while now! 2nd Rod Harris. Another solid regatta from Rod. Probably not the fastest out there, but was always up there. Continued wand work has given him a good controllable set-up in breeze, and plenty of winter sailing has given him solid boathandling. A good result for the Prowler, and good evidence that there isn’t a lot between all the packages that a bit of tweaking can’t fix. If it had been a lighter event Rod would have been the first to admit that he wouldn’t be able to hang onto some of the lighter wind specialists, but it remained breezy and he converted that into results. Overstanding a few laylines, and not doing the full maths before the last race possibly cost him the win..
3rd Mike Lennon. Always up there, but never quite converted that into any race wins. He’d shown great pace early in the season, but either the fleet has caught up, or he’s slowed a fraction. Lots of rig playing didn’t look to have produced results yet. 4th Paul Hignett. He hadn’t really been seen up with the front four in the first four races, but a great last day with a 1st and 2nd, propelled Paul up the results sheet. 5th Ricky Tagg: A weld failure in his wand system resulted in a RTD in race one, but he started to get the feel of his new Mach 2 as the event went on, and showed impressive pace at times. 6th Geoff Carveth: Consistently up there, and with a good race win I thought Geoff was the person to get 4th from me, but I hadn’t accounted for Paul and Ricky’s final day showings. 20th Katherine Knight: Fresh from learning much about high wind sailing at the Europeans Katherine sailed a great event to get round the course in conditions that were too much for most of the fleet. She had just one rtd when the shroud fitting pulled off the wingbar, but somehow she caught it and was faced with an interesting what to I do now dilemma! The Mini rig once again proved its worth, and I’ll do a proper blog post on that soon. Equal Last: Simon Payne. Simon missed the first race as he was at his sons sports day. Many thought he’d rock up and win the remaining races, but a reoccurring issue under the bonnet stopped that. The issue was with the through deck wand control cable that had been moved slightly on his prototype boat, but didn’t remain attached enough. The two repairs attempted in the car park didn’t hold either. 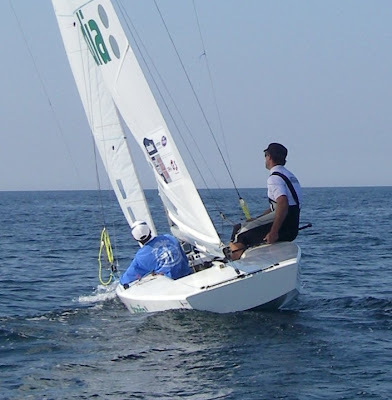 He lead round the windward mark in the two races he started, but headed ashore soon after. Outside of the top few, there are a lot of people going about the same speed, but the biggest factor around the course is the extra distance being sailed by people overstanding laylines upwind and down. Congratulations to Iain Percy and Andrew Simpson for winning the Star Europeans. Robert Scheidt won the open title, but it was an impressive result for the guys given the 9/10 month break since winning Gold in China. It was great to be able to go and work with them before the regatta. I think I learnt more from them than they did from me! but they've asked me back to do more with them so that is good. Trying my hand at a spot of Star crewing - just need to put on 40kg! From one Europeans and on to another. 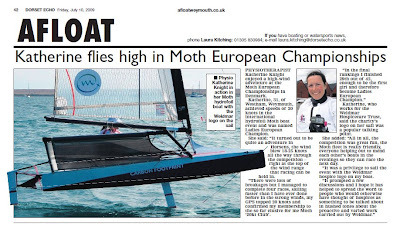 I’m now in Kiel, helping out the Star team of Percy and Simpson in the week leading up to their Europeans so it is a good time to reflect on the Moth Europeans just gone. It is quite funny going from flying around in a Moth the other week to a spot of Star helming and crewing! I’ve always loved the Star, but at 30-40kg underweight I think I’ll stick to the coachboat watching them for the moment! So the Euros didn’t go so well for me, but more about that later. In what is quickly becoming Moth tradition, we had a big case of ‘it’s not normally like this!’ 7-14knots during practice became 20/25knots with a nice chop. Arnoud won, but it couldn’t have been any closer between him and Simon, all coming down to the final race after countback couldn’t break them. They were a class apart from the rest of the field, sharing all the race wins between them. Arnos regatta didn’t start very well when some rigging let go just a boatlength or two after launching for race 1. Fortunately the Swiss support team was quick to respond and he was back on the water after a quick re-rig, only to be back in again soon after with a wand issue. Ultimately I think Arnoud just started a fraction better than Simon, and Simon was on the back foot a little more. Third was Eelco Boers in a Bladerider VRX. Hadn’t really seen him before the event, and he kept a low profile on the race course (lots of black Bladeriders looking similar!) but good pace upwind in the breeze kept the results coming. Fourth was Mike Lennon. Always up there, but never quite able to challenge the top three. Fifth was Mike Cooke. 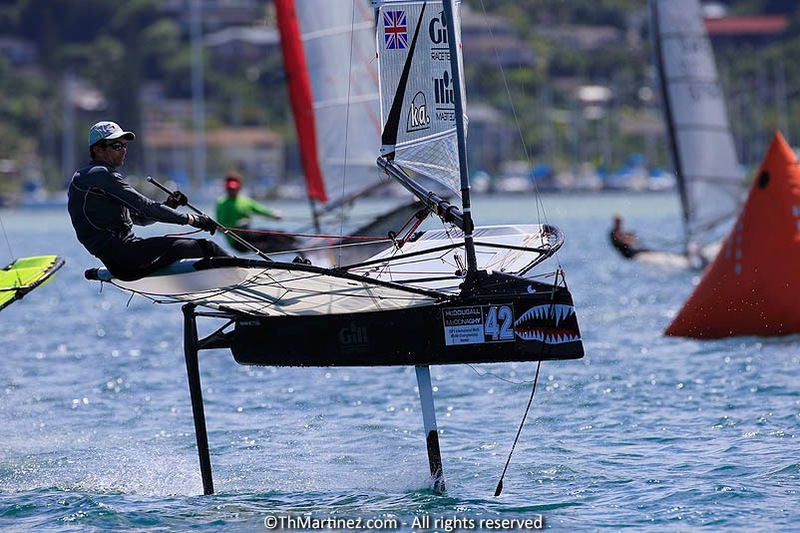 A superb regatta from him in his new Ninja. Solid pace kept him in consistent results. Sixth: Rod Harris – A bit down before the regatta (“why spoil a good day with racing!”), Rod persevered with his wand set-up to ultimately find some good pace and control in the breeze and sailed a very solid regatta to keep chipping away good results. Katherine and ‘Carbon Footprint’ had a great event to be first female competitor, and to get round in all four of the races on the last day, while many decided not to sail, or headed in early.